THIS PRODUCT SHIPS VIA FREIGHT. PLEASE CONTACT BEFORE PURCHASE FOR A QUOTE. The DeltaVS front bumper is like none other on the market today. 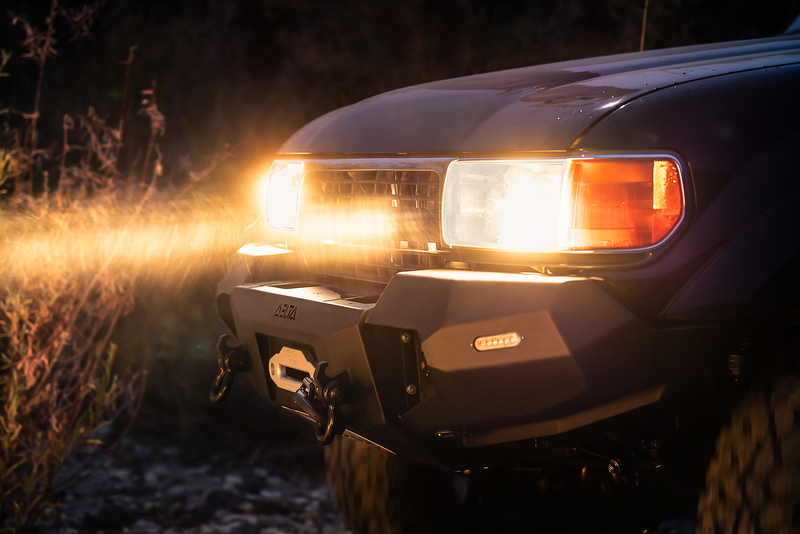 Driven by the need for off-road clearance while maintaining strength and dashing good looks, this bumper will both protect your vehicle and add functionality. With a hidden winch tray, interchangeable light mounts, included LED turn signal lights, dual purpose shackle mounts with integrated “quick-hook”, and optional bull-bar, this bumper goes the extra 10 miles. The bumper is incredibly easy to mount, and includes stainless steel shims so you can get that “perfect fit”. One of the more unique aspects of our bumper is the removal of your stock valence. By taking off that flimsy, usually bent, piece of sheetmetal and closely following the body/light/grill contour, you will get the best of both worlds: extremely high clearance AND the kind of super stout protection you can only get from a deep and tall metal structure. The winch mount incorporates industry standard fairlead mounting holes which can be completely covered by your front license plate if you run without a winch. The bumper has enough depth on the top to act as a nice work platform/tool storage/”cold beverage” holder (when camped for the night, of course), all without sticking out obnoxiously far from the grill. The winch cavity is designed for a WARN M8000 “style” winch. Others will fit, but that’s what it’s designed around. Clients have installed WARN VR-10s with room to spare and we have installed Badlands 12k with room to spare. Everything you could need, from installation instructions, to spec sheets, and more. If we have supplemental content for a product, you can download it here.